Pinnacle at the Pier is located in one of BC’s most beautiful neighbourhoods – North Vancouver. Nestled right by the ocean, the Pier has stunning waterfront and mountain views and a marvelous mix of inside and outside facilities to help your event come alive. This unique boutique hotel makes an ideal seaside getaway and a perfect venue to host your wedding. 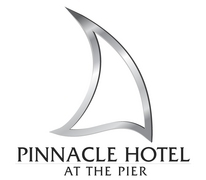 From an intimate wedding of 14 to a grand celebration of 400, Pinnacle at the Pier is proud to offer the space and help you need. Ours is an inspirational setting for your wedding, with 16’ high ceilings and floor-to-ceiling glass windows that hold spectacular vistas of the historic Wallace Shipyards, Burrard Inlet and downtown Vancouver. And space is never an issue – we have the largest conference and ballroom facility available on the North Shore. With 8,000 square feet, we can configure the right space or room size for any celebration. We loved The Pinnacle, nothing but positive things say. The decor is modern & very pretty (I've attached a picture so you can see the wall paper & gorgeous light fixtures). The food was especially good & very fairly priced. The staff really did an outstanding job from start to finish.